A handful of local residents joined Fairfax County Department of Transportation representatives Thursday at Dogwood Elementary School to discuss how best to increase pedestrian safety in the area of the Dulles Toll Road. 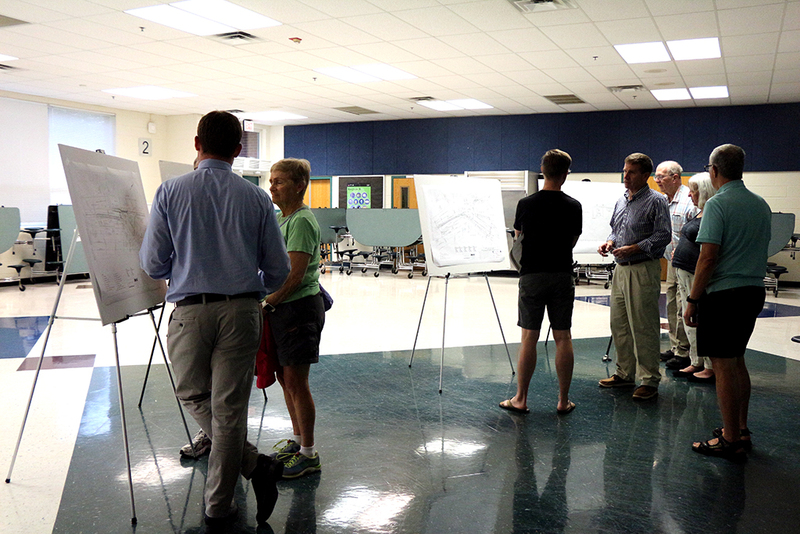 FCDOT hosted the community meeting to discuss options for proposed changes to the crossing of the Fairfax County Parkway Trail over the eastbound Dulles Toll Road ramp. In that area, the crossing is around a curve as cars northbound on the parkway turn onto the ramp. FCDOT has given two options for safety improvements at the intersection in question, which was flagged as part of the Reston Metrorail Access Group (RMAG) II improvements study. It is proposing either at-grade improvements including a signalized crosswalk, or the construction of a pedestrian/bicycle bridge over the ramp. Adam Lind, FCDOT’s Bike Program manager, said neither choice was the department’s first option. The two options that remain have a vast difference in cost. The at-grade improvements would cost about $633,000 to implement, according to FCDOT, while the cost of the bridge would near $7 million. Lind said the at-grade option focuses on improving sight distance by bringing the trail up to the shoulder of Fairfax County Parkway and creating two one-lane crossings instead of the current two-lane crossing over the ramp. He said options of stop signals for cars or the installation of a Rectangular Rapid Flash Beacon to alert drivers are also being considered. The bridge option, Lind said, would require about 700 feet of structure. It needs to be so long and high, Lind said, to allow 18 feet of clearance on the ramp below it. The result would be a bridge that travels parallel to the ramp as its elevation increases, then crosses, then decreases in height back down to the parkway. Lind said there will be a lot of other projects similar to this one in the area as connectivity to Silver Line Phase II Metro stations is addressed; however, he said, this particular intersection doesn’t directly affect Metro access. While it may not directly connect with the Metro, local residents Norman and Barbara Happ said the crossing is very dangerous for pedestrians and bicyclists and they are happy to see it being addressed. FCDOT will continue to collect comments on the project through Friday, Sept. 29. Those comments can be made online; by writing the FCDOT Bicycle Program at 4050 Legato Road, Suite 4050, Fairfax, VA 22033; or by calling 703-877-5600.